You reached the end of the Blog Hop!!! 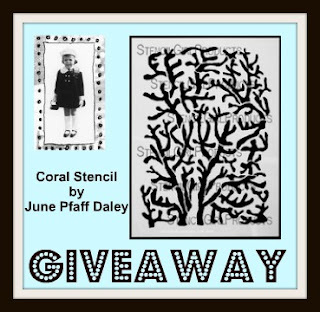 you will also be entered into the GIVEAWAY on the StencilGirl Talk Blog to win June's Seashell stencil! Thanks for HOPPING with StencilGirl! This is another great stencil hop with lots of giveaways! The best part? Seeing so many projects and ideas. It is great! Awesome hop. I loved everything about this. My favorite part was the cupcake Sprinkles stencil. I absolutely love that!!! It looks to be so much fun! Thank you all for a chance to win such amazing products!!! I loved your hop. I loved the maps and the sea horse and and and... they all did a fantastic job. I loved learning the various mediums that were used. I must go to my local craft store and see what else Golden's sell..Thank you for the prompt. My favorite thing about the Hop was finding all you creative people! Now I must go back to each and check out more of your blogs. Stencils are FUN. Loved the blog hop. I think something like this shows the diversity of stencils. It certainly has opened my eyes. All the featured blogs and projects are amazing! Loved everyone's work and the diversity of how they all used the stencil! Loved the vase...simply amazing! It has inspired me to try this weekend! The organic undulations of the seaweed stencil are just magnetically drawing me in. Would so love to win this one! I love these hops, inspiration, fun. Ideas art, what could be better. Oh yes the chance to win one of these wonderful stencils. I don't know that I could pick a favorite part because the whole thing is great. I guess I love the sea part since it is so hot here. I would settle for some rain if I can't have the sea! LOVE this blog hop! My favorite part was looking at different ways to use the mediums in my collection with my stencils. I also loved seeing the ideas of how to look at different things (like your painted paper) in new ways! Thanks for organizing this. Love blog hopping. I am inspired by the samples, tools, ideas. Loved looking at the way you all created different looks. Another incredible hop Maria. There were so many wonderful ideas, but I just love June's cushion! Gosh, this was a really fun blog hop...it would be tough to pick a favorite project. I think my favorite part of the hop was being introduced to the many different artists...some I already knew, but many I didn't. I also love being inspired by all the different ideas! so many fun projects. I have always loved stencils starting way back as a kid with the cardboard letter stencils. That is going back a long way. So many fabulous ideas! I loved June's cushions! Great Hop! Love all the projects! My favorite parts of the blog hop were the art journal pages: the fairy with the coral and the seahorses. Thanks for the hop! Love all the participating projects! Thanks for the Blog Hop! I'm sorry, I can't pick a favourite. Each piece is fantastic in its own way & all the artists are very talented. I love these blog hops, so much inspiration. I enjoyed all the posts but especially liked how Paula used the paste and ink to build up her cupcake. So cool. Everyone did such fabulous stuff with those stencils. An impossible task to choose just one technique or artist. Must say that it was fascinating to see how versatile stencils can be. I love that moulding past can be used with them to create relief texture. Wow....it's hard to choose - the whole team is so creative. I would say my favorite part of the hop was seeing how different designers used the same stencil on different projects - beyond paper. Just lovely! So much amazing work! Love it all! It's so interesting to see different interpretations and techniques! All of the artwork was gorgeous, but I loved loved loved the pillows!!! I really enjoy seeing how everyone uses stencils in so many different ways. Sometimes I get in a rut and this kind of blog hop really stimulates all kinds of ideas. Thanks for offering the giveaway opportunities. The best part? Feeling involved in a virtual creative community and appreciating the sharing from the many bloggers. Thanks so much for organizing this hop, Maria! i love a good blog hop with lots of inspiring ideas and chances for prizes, too! Mary Nasser's if I have to choose but they were all great. I'm just learning about mixed media so I like looking at the cool projects. Overall I love the theme of this particular set of stencils. Blog hops are always so much fun!! I enjoy seeing all of the different interpretations of the same "tool". I loved all the projects and the post were delightful. I loved joining the stencil girl monthly club, and I think I loved the sea shells and swimming with sea horses how soft and fun. Thank you for the hop of course I love Marjie k's work she always inspires me. I've hopped them all. :-) Love your art! It's very inspiring. I just love getting to see so many different artists take on a theme or stencil....love the variation! My favorite part of the hop were the projects done with the sea themed stencils. I love the ocean and haven't been in a few years and really miss it. Maria this was such a fun blog hop, especially because I got to meet new artists and enjoy their fabulous projects. Thanks for the chance to win the coral stencil! Thanks for all the inspiration everyone. I love to see stencils used in new and exciting ways, Carolyns glass bead gel seahorse was great! My favorite was Mary Nassar's use of the seashell stencil over her map background. But really, all of the projects were great -- so much variety. Thanks for the chance to win! My favorite part is seeing how each artist can take a stencil that seems rigid in its results and seeing what different things they can do with them! Thank you for the fun blog hops and the chance to win such cool stuff! My favorite part of the blog hop is seeing everyone's creative ideas and projects!! So inspiring!! Also love seeing stencils used! Awesome blog hop!! My favorite part is seeing how each artist interprets a stencil in their own way. Beautiful projects and inspiring ideas! I think my favorite use of the stencil was June's pillows - just gorgeous! The stencils are great, and I enjoyed the different techniques each artist used. To learn some techniques that are new to me. WOW - such talent .... that was an awesome hop !! Thanks. I love the blog hops. Love seeing all the different techniques used. Thanks! It never ceases to amaze me that people can take the same basic tools and create such diverse results, all interesting, all instructive and inspiring. The best part has been seeing the way people use materials differently to the way they were created by the manufacturer. This has been the most fun! I love all the different ideas and techniques and materials used with the stencils... it got my muse dancing! Being new to all of this, I am awed by all this talent. My "left" brain is gradually emerging, and I am enthralled by each place I've been. Fabulous hop, and great new stencils. I love seeing all the different projects. So much inspiration to learn from! The stencils are great... and the projects an inspiration! I enjoyed going to different websites to check out different uses of the same stencils, each are inspiring and each is lovely! I love the stencils and hope to win one! My favourite part of the blog hop was seeing all the different techniques the participants used and the inspiration I got from seeing their work. My favorite part was all the supplies used I have never tried. I'm going to have to go shopping. Love the Greek stencil!am I too late to enter giveaway? You made it in time SQ54 :) You have been entered.